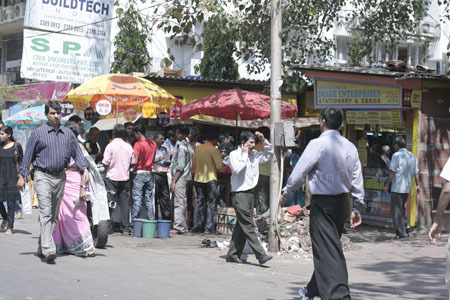 One of the features Mumbai is famous for is street food. 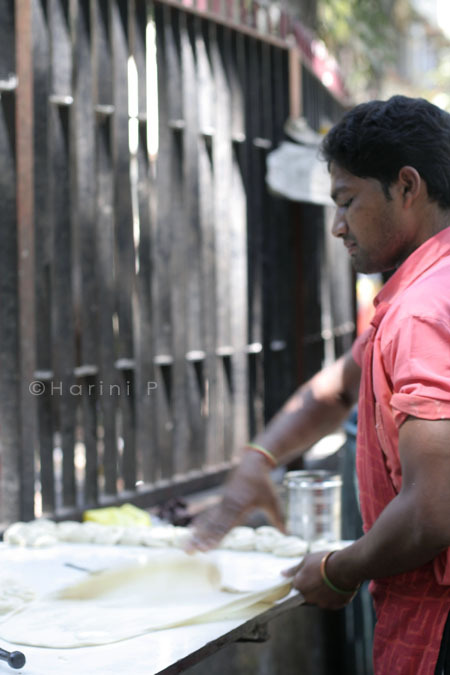 Every area has its own ‘khao gali’ – khao meaning eat, and gali meaning lane. 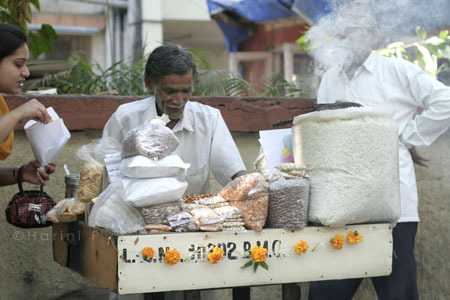 One such is the khao gali at Marine Lines (Next to UTI building). This street hosts many commercial and residential spaces apart from institutions, and holds many memories for me. When I was a student at Nirmala Niketan in Churchgate most of my friends would run down to khao gali for eats. I carried packed lunch from home and often envied the others. My parents were particular about not eating street food from such stalls. They were right too. Khao gali was not a very hygienic place to catch your grub but the quick service and low prices proved to be a crowd puller. I however did not want to be left out and had my first ever pav-bhaji in Mumbai at khao gali, from Lenin’s pav bhaji stall. ‘Pav bhaji’ is quintessential Mumbai food and though it is available all over the country now, none of them come close to the taste and aroma from the city of its origin. Lenin’s pav bhaji stall also makes a spicy mush of rice and veggies with lots of red chillies and garam masala dunked in, called a ‘biryani’. It is an insult to the original biryani and is probably responsible for the contorted version cooked in most houses. The pav-bhaji was a winner though. Back then I wasn’t vegan and the loads of butter that was slopped over my ‘bhaji’ proved a weakness. With time the hygiene in the area improved. The first stall in khao gali is a juice stall that serves quick ‘mocktails’ (they really mock ’em), fresh juices (from cans and steeped in loads of sugar! ), and sandwiches. I discovered ‘mix-fruit’ here and remained a faithful endorser (despite the fact that I knew it had canned pulp!) till I found that this too was not vegan. The mango pulp is mixed with milk. Mix fruit is a glass full of fruits and dry fruits suspended in thick mango pulp. It comes in a huge beer glass and is best ordered ‘half mix-fruit’ (Rs.30/-). In India people often fast for religious reasons and abstain from consuming grains/pulses during the ‘fasting’ period. 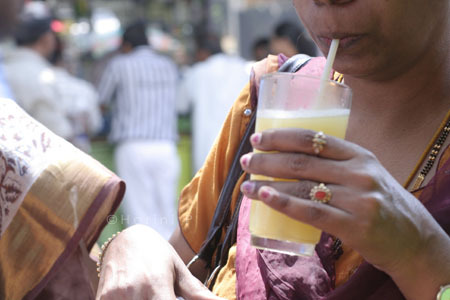 Mix- fruit comes as a boon and is the most sought after item in this juice stall. I have blogged the recipe long back here. It remains one of my Summer favourites when we get tasty alphonso mangoes, though mine has very less sugar and more of coconut milk these days. The sandwich comes customized. Today I asked for ‘no-cheese, no-butter, only-chutney’ version while my friends had the more fatty version. What can one say about a sandwich? Everybody loves them and I am no exception. 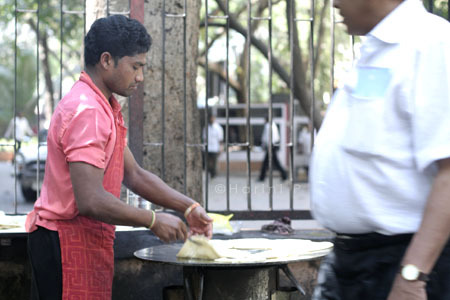 one street side dosa vendor who used to be popular when I was a student. 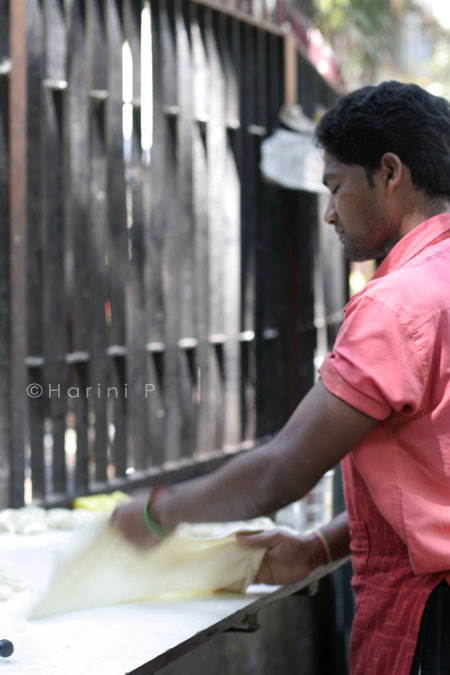 I could not take a picture today as the dosa vendor seemed to be having a slack period. Students are a good target. 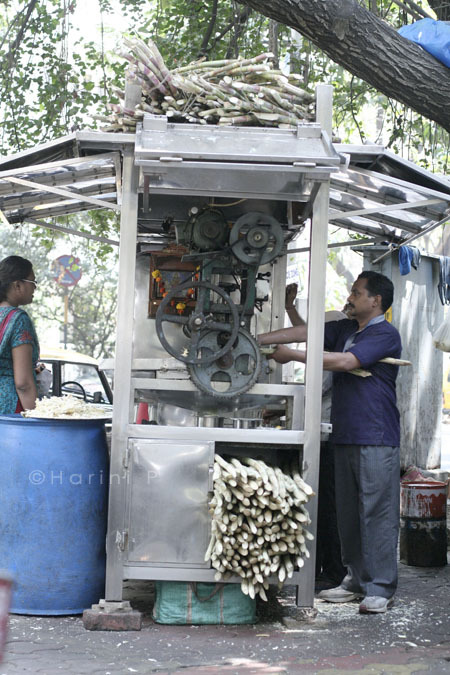 Just outside Nirmala Niketan is also a sugar cane juice stall. A little distance away you find a ‘roomali roti’ maker. He was so quick that I could not get a clear picture of the action involved. The climate in Mumbai is hot almost round the year except during the rains and in December, and another favourite among people are fruit salads. Every lane has to have a salad-cart. The mixed fruit salad comes with lots of papaya, water melon and a slice or two of other fruits. How else does he sell at Rs10/- a plate? After a long gap my friends and I visited khao gali today. I quite enjoyed the photography session as it flooded me with beautiful scenes from two decades back. 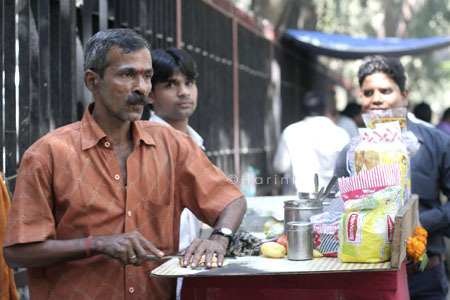 Due to lack of time I could not get pictures of the ‘fresh coconut water’ vendor, the pani puri wallah and a few others. Maybe I should eat out more often? Recalling my days, when i was in mumbai. Since I have been blog hibernation for quite some time, I hadn’t read this post of yours until now. Next time I visit, we should go to khau galli!! Yes, we will! There is one at Crawford Mkt too. I found it too unhygienic to eat but it is an interesting place. Sreelu, did it make you drool? Maybe you should plan a trip then:). Thanks for visiting! Harini, so glad to have stumbled upon your blog, love your creations ,recipes and pics. 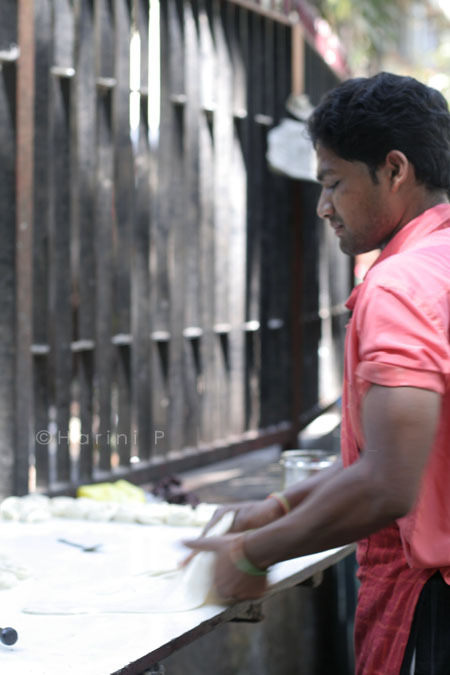 your post got me all doowy goovy and crave for desi street food. i love this photo doc – so nice to see people so engrossed in the act of eating or feeding. WOW..amazing pics and great post!! Your post really took me back home..Love Amchi Mumbai. First time here..you have a lovely space with great dishes! Vidya, I think you should! We will have a blast! I haven't been to places in Chembur. It is too distant for me to travel. Now I am totally motivated to visit Mumbai! Have you tried Pav Bhaji @ Turning Point in Chembur,if it still exsists?So far I have never eaten anything better than theirs'. Michelle, most breads here come without milk. However, I make my own and rarely purchase because I prefer them homemade. 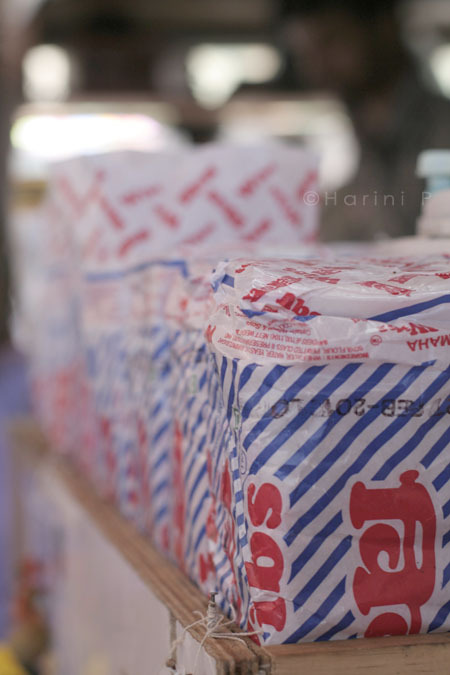 The sandwich breads have only flour, yeast and water. Breads with milk get mentioned as milk breads. I did not know NN has a sister institution. Hi, Lovely post and pics.U have some amazing photography skills ….absolutely loved it. First time here.. great going… Glad to follow u..
From the time I've moved to Pune, there are n number of reasons that make me miss Mumbai and now your post goes among the toppers. Love this post. I am very much a prefer-Delhi-to-Bombay person, but even I have to admit when it comes to street food, Bombay totally rocks. By the way, does the bread in Bombay have milk in it? Was wondering, as you can get vegan bread here. Wowo it really took me back to Mumbai. How i wish I was there even for a day. Thankyou for sharing the pictures. What fantastic photos! Thanks for sharing!